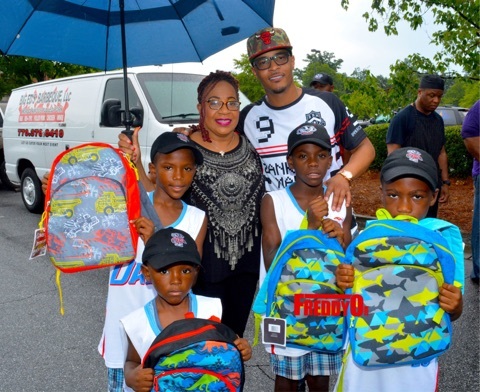 Atlanta, GA. 4 August 2016 – School children from all over Atlanta were gifted with dozens of backpacks and supplies for their first day of school courtesy of The King of the South, TIP “T.I.” Harris. Held at the Cascade Crossing Shopping Center, TIP along with Greg Streetof V-103 the People’s Station and Saving Our Daughters Organization, hosted their first ever event which encouraged members of the community to register to vote, open up bank accounts with Citizens Trust Bank, one of the largest black owned banks in the southeast, as well as grab new supplies to start their kids year off on the right foot. As TIP arrived, all you could hear through the pouring rain was shouts of joy and a chant screaming, “T.I., T.I., T.I.”, from all of the excited children. Every child not only received a backpack full of essentials to further their education, but they also had the chance to snag a picture and have their bags personally autographed by the legendary rapper. As the children sported their new bags, TIP stressed to everyone the importance of education, being respectful in school and staying assertive. He also asked every parent or guardian to make their way to the stations set up to register to vote and consider opening up bank accounts in an attempt to turn their community around for the better. After every bag was distributed, TIP had one of the city’s best BBQ restaurants, Big Ed’s BBQ, on-site grilling delicious food for everyone in attendance. “It’s always a pleasure to be in my own community of Atlanta and give back to those in need. Thank you to my brother Greg Street of V103, Saving Our Daughters and the team at Citizens Trust Bank for assisting me in providing school supplies and offering access to voter registrations and new bank accounts,” TIP stated. Notables in attendance: TIP “T.I.” Harris, Greg Street (V-103 FM), Ferrari Simmons (V-103 FM), Zuse (Rap Artist), Shun Hendrix (singer/ Hustle Gang), Kap G (Atlantic Records/I Am Other recording artist) and Yung Booke (Hustle Gang artist). This year, Tip starred in the Emmy-nominated series “Roots” that premiered on HISTORY Memorial Day, and will be featured in the upcoming movie “Sleepless Night” opposite Jamie Foxx and Gabrielle Union. The fifth season of his hit VH1 series ‘‘T.I. & Tiny: The Family Hustle,’ debuted July 18 and the series “Sisterhood of Hip Hop,” of which he is an Executive Producer, premiered July 12. Tip also kicked off his exclusive 2016 Drai’s LIVE residency at Drai’s Nightclub at The Cromwell in Las Vegas on March 5 with performances scheduled throughout the summer. His two clothing lines Hustle Gang & Akoo are currently in stores. Saving Our Daughters is a 501(c)3 nonprofit organization whose philosophy is to build a movement that begins with experiential literacy and effortlessly flows into recurring civil actions (words and actions). Saving Our Daughters (SOD) initiativesfocus on reaching thousands of teen girls and youth across the country with our celebrity, corporate, and community partners making it possible to spark positive activism. Our words and actions model empowers teens to forward the mission as well as further ignite their inner purpose individually or by leading a group at their home, school, or community.